When you’re searching for horseback riding near me on the web, we bet you’re looking to have fun riding horses. Whether you’re interested in a casual day of trail riding or are dedicated to years of taking horse riding lessons, there’s always fun to be had! But did you know that horse riding is also good for you psychologically? It’s affecting the brain in a myriad of good ways, and that’s what we’d like to talk about today. Stress can be a literal killer in today’s world. It affects the brain, which in turn affects our overall health. It can also cause us to focus on the negative aspects of life, further harming our psychological and physical health. Riding a horse releases endorphins and other feel-good chemicals that make you feel good. If you’re having fun (and we bet you will! ), these euphoric chemicals will be released by the brain, reduce your stress, and make you feel better. It doesn’t matter if it’s the gentle swaying during horseback trail riding on the back trails of Lake Worth or fast riding at our horse riding school…you’re simply happier when riding a horse! When you ride a horse, you’re outside 99-percent of the time. While riding lessons might eventually lead to an indoor arena for competitions, our horse riding lessons and trail rides here in Florida are outside. And the fact is, most of us could use some outside time. 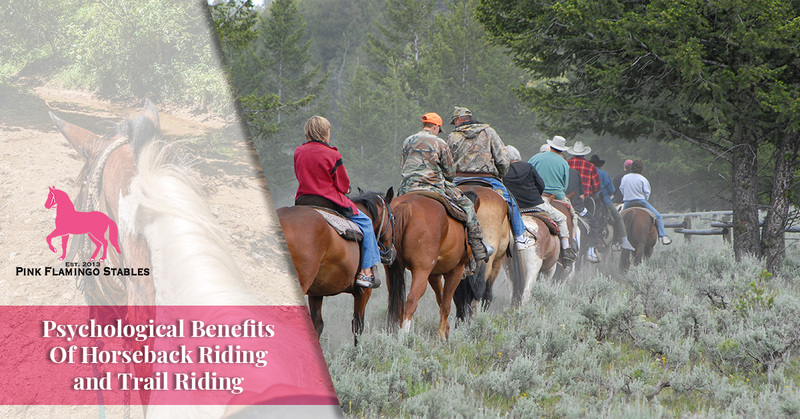 Being outdoors releases many of the same feel-good chemicals that horseback riding does. Whether you’re from Florida or not, you’re going to spend some time outdoors in Lake Worth in places you’ve never been before. Our horse riding school is surrounded by lush Florida greenery, an excellent place to fill your lungs with fresh air. Horses also show affection, and they’re out pets, our companions, and our friends. As long as you treat a horse kindly, they’ll do the same. There’s nothing quite like getting nuzzled by a horse out of the blue, simply because they want your attention or are interested in showing you affection. Humans seem to love rocking motions. It starts in the womb, of course, and then the motion calms babies down when they’re upset. Then there are rocking bassinets, baby swinging chairs, and playground swings that babies and kids enjoy. This love of rocking even sticks around for most adults in the form of boats, rocking chairs, and porch swings. So it stands to reason that the rocking motion of a horse ride can soothe us. Whether it’s the gentle side-to-side rocking of trail riding or the forward and back motion experienced during horse riding lessons, the motion speaks to us on a primal level. No matter how long you’re here visiting our stables, you’re bound to feel better when you leave than when you showed up! Whether you’re looking for a horse riding school or simply a day of casual trail riding, we look forward to seeing you. Click here to start the process!